Meet Coco, the darling nine-year-old Chow Chow I met in the parking garage at work yesterday. A colleague discovered Coco taking a nap on the concrete floor of the parking garage and went over to make sure she was okay. That's when Coco hopped up and trotted away, limping as she went. Two security guards helped my colleague keep tabs on Coco, making sure she didn't go out into the street or get hit by a car. My coworker called me, asking me to bring a leash with me when I came to work. Just five short minutes later and with leash in hand, I walked over to the trio trying to coax sweet Coco into their arms. There were two security guards on one end and my colleague on the other. Coco hobbled her way through the maze of parked cars. I watched her carefully and put myself directly in her path but out of her sight. I got down on both knees and greeted her with a warm hello and something like a hug as she walked around the corner. She still had a collar and license tag on her so I hooked her up to the leash and took my phone out to call the number on the tag. Luckily, Coco was registered to a home in Roswell, Ga., some 20 miles north from where she was found. The lady at Fulton County Animal Control gave me the Chow Chow Mom's name and number, and I thought for sure we were about to make a happy ending. I couldn't reach Coco's Chow Chow Mom. Neither could the security guard. That's when he revealed that he had caught a few other people dropping off their dogs in our parking garage time and again. He said he wouldn't be surprised if this was another case like that. I was disheartened. My coworker and I looked over Coco. It was clear she needed to go to a vet. 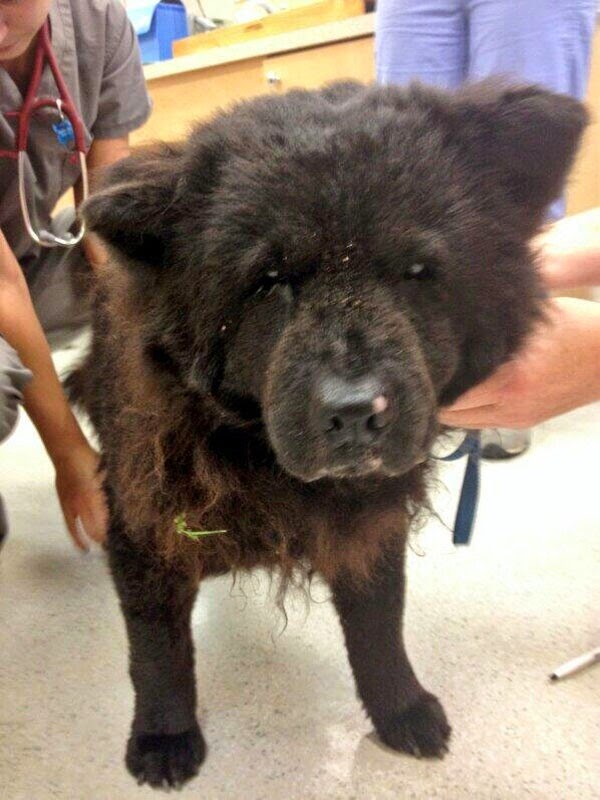 She was limping and she was dangerously thin, especially for a Chow Chow. We slowly coaxed Coco into the car and were about to drive away when the security guard came running back saying Chow Chow Mom had returned his call. He handed the phone to me and the conversation was short and not so sweet. Chow Chow Mom claimed sweet Coco had gone missing only one day ago. Clearly, Coco had not eaten in days, perhaps weeks. She was matted and her eyes were caked with dried goo - as if she had conjunctivitis. Then, she said it might be two days. Chow Chow Mom told the security guard Coco had jumped from her car door but told me Coco ran out the front door of her new apartment. She asked I not take Coco to the vet and that I return Coco to her so she could follow up with her own vet. At first, this seemed like a completely reasonable request and I told her I'd gladly meet her at her vet - where was it? Chow Chow Mom didn't know. That's okay, I said. Do you have the name? I can Google the address and still meet you there. She didn't. I began getting an uneasy feeling about the whole situation and decided it was best we take Coco to a vet to see if a professional could tell us whether this pup had been neglected and if it was safe to send her back home. Chow Chow Mom seemed to be getting irritated at my insistence that Coco needed to see a vet. I told her I'd send her the address to where we were taking her and she could meet us there. In the minutes that passed, Chow Chow Mom blew up my phone - calling me from three or four different numbers and leaving me angry voicemails saying, "You have my dog. I want my dog." She kept calling the security guard, too, who repeatedly assured her Coco was safe and we were headed to the vet and would call soon. We arrived at the vet who welcomed sweet Coco in without an appointment. The vet took a look at her and said it was obvious that Coco hadn't been treated very well, assuming she had been at home with Chow Chow Mom just a few days ago. She said it looked like Coco had a very large tumor in her mouth but test results came back negative for cancer. The vet fed Coco and gave her water. Now the question was: what to do? The vet offered to call Chow Chow Mom and feel her out. She said she had to give Coco back to her owner but if she felt at any point that it wasn't a good situation for Coco, she would report the situation immediately. Chow Chow Mom's story was again different from the one told to myself and the security guard but other than that, the vet felt she checked out and said she was sending sweet Coco home. I called later that afternoon to make sure Coco had indeed been picked up and a part of me wished she hadn't because of this feeling in my gut that she might not be going home to a good situation. Alas, sweet Coco had gone home. My colleague and I haven't stopped thinking of Coco since we left her at the vet's office. We keep telling ourselves and each other that we did the best we could and what happens from here is completely out of our hands. Scottie Dad tells me I just have to trust that Chow Chow Mom was just stressed out and that Coco really did go back to a loving home. He says that no matter what, we did a great thing that day. I wish I believed this was true but there is something to be said about a woman's intuition. All I can do is hope. Hope that Coco is safe. Hope that she is happy. And hope that she has the care, love and support she needs to live out the rest of her sweet life. Oh my gosh!!! How terrible!!! I am like you...it doesn't feel right.... But you have done a great thing...all we can do is pray... Keep us posted. Sounds like she was either gone for a very long time, or the owner wasn't taking great care of her... we dealt with these kinds of situations all of the time at the vet hospital when I worked there. It's not easy, but it happens. Hopefully, this will be an eye opener for the owners and maybe they will step it up a bit. :((( What you and your coworker did was a very good action. If all the people in the world would feel involved in the way you did before such situation, many animals would be saved and far from people who are not responsible to take good care of them!!! . Let's hope Coco is fine... And let's also hope that if this is not the case, then the forces of nature lead Coco to a much better place to much better family!!! Let's hope...!!! Whoopsies-I just cost Him a bunch at the vet today. To quote "Ed McMahon", more to come. Then when we went to the mail, we saw a doxie loose. It was on the front yard of someone in the neighborhood who has a doxie. He went to get it but the doxie ran away and ran to a different side of the property and went into the neighbor's back yard by crawling under the RV gate. We left a message on the neighbor's phone because in coyote country that's not good. They believe that if your take responsibility for a dog, you have it for life. If your circumstances say you can't even survive yourself, you make arrangements. Kali was rescued, spent time on death's row, adopted and returned because she is so active. It's been 3 months and she's cool now-she knows she's her forever and she's calmed down (just a tad). Kaci was also on death's row but is so sweet she would never have been turned back by anyone with any feeling. Ugh. We're sure you have a sad heart tonight. My peep thinks you deserve a big hug for doing the right thing! She found a dog running on a very busy street and took it to the emergency vet since it was at night. The owners were so mad they had to drive 10 minutes to get their dog. It's heartbreaking other peeps don't take care about their pups. well, personally, if I had any doubts, I wuld have called Chow's mum back and told a little white lie and said she had run away again. i would then have removed her collar (hoping she had not been tagged) and got her treated and re-homed and feigned ignorance. BUT, what you did was to show a poor little dog some real kindness for what must be a large amount of unkindness in its life. so you have nothing to beat yourself up about. OMG Coco is just so adorable! I never cease to be amazed at how some people treat living creatures. It's just appalling. Poor little Coco, through no choice of hers I'm sure, was unfortunately stuck with a very horrible human! You should not feel guilty, although I know you will, you did the right thing. Heck, in this day and age this horrible woman could have sued you for taking her dog had you not allowed her to take Coco back - you just never know - people are crazy. Let's just hope and pray Coco is on her way to recovery and this woman has had a wake-up call and will be a responsible pet friend (owner). I've got an uneasy feeling too while reading. And at the end I had tears in my eyes for the poor pup. You did the best , let's hope together for Coco, even when it is so sad that it is all what we can do. Thanks for being there and for the help for Coco. it is a sad story; hard to say what to do. There are plenty of dogs with similar situtations. Yes, like some others have said, you had to do the ‘right thing’ (legally, I mean)…here’s wishing/praying that Coco really was loved & cared for at her home. Did the vet say they would follow up with the owner. If Coco was mistreated or neglected the vet should have pressed charges. Its obvious the owner cared little to none. She could have surrendered Coco. Coco could be cared for and then adopted into a loving home. I would keep following up or at least ask the vet to. Blow her phone up. I hope you follow up with Animal Control with the information from the tag so they can go do a “welfare” check! Actually I agree with the last comment by Bella. Animal Control might be a good option. Paws crossed for her. You did the right thing. Have a tremendous Thursday. This story is so tragic for you, your friend and the poor dog. I agree with Bella that you might want to follow up with Animal Control. It's too bad your vet couldn't persuade the woman to surrender Coco to her and then the dog could have been sent to a rescue group. You should be proud that you tried to help. Glad you did the right thing by having a vet look at her, and you also had to let her go home, but the Vet should have called animal control to check out the home and Mom. Scottie Mom, you are a saint. I know what you mean. I hope sweet Coco will be okay. There are some rotten people in the world that should never have pets. Keep us posted if you hear anything.